If you are looking for a new refrigerator you should definitely consider a Jenn-Air since it is one of the best refrigerator brands in the industry. For years Jenn-Air has taken the best in state-of-the-art technology and combined it with the durable design necessary for home appliances. Jenn-Air refrigerators are both beautiful and practical with eye-catching designs and the ability to customize storage options. By following our expert advice you can quickly solve any most of the common problems experienced by those who own Jenn-Air refrigerators. If it seems like the problem you are facing with your refrigerator is a bit more serious you can always call the Jenn-Air repair team. If you try and solve a serious problem on your own chances are you will only make the situation worse. Problem: A Jenn-Air Side-By-Side Refrigerator with the Filtered Ice and Water Feature has a red indicator light that refuses to turn off. If the water filter has been replaced what else could be wrong? Solution: As long as the water filter was replaced properly you probably just need to reset the indicator light. Holding down both the Water and the Lock buttons for four seconds will reset the indicator light. To show that it has been properly reset it will blink green three times. Problem: A Jenn-Air Bottom Freezer French Door Refrigerator should not have pieces of white debris floating in the water after the water filter has been changed. What is wrong? Solution: If you are having this issue the problem is hard water. Hard water deposits and lime scale buildup in the pipes and pieces sometimes break off and get into the water system. Your Jenn-Air water filter is not always able to catch every piece of debris. The best solution is to get a water softener in order to solve the hard water problem. Problem: Mold should never be in my refrigerator, so I want to get the mold off of the defrost tray as quickly as possible. Unfortunately, there are some parts of the tray that I simply cannot reach. What should I do? Solution: In order to fully access the defrost tray for some refrigerator models you need to remove the kick panel. This will give you the access that you need to remove all of the mold from the defrost tray. An alternative solution for removing the mold is to pour a mixture of bleach and water into the defrost tray and allow it to kill the mold in the tray. After the water and bleach mixture dried out you can blow any remains out with a bit of pressurized air. Problem: There should not be any ice forming around the door of my Jenn-Air Bottom Freezer French Door Refrigerator right? The food in my refrigerator should also not have a frosty appearance, so what do I need to fix? Solution: The frosty appearance of food in the freezer is an indication that there is warm air entering the refrigerator. 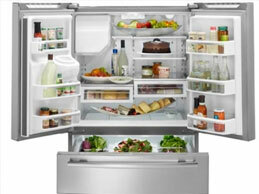 An improperly closing door is the main culprit for allowing warm air to enter the refrigerator. Check to make sure that the refrigerator door has no obstructions preventing it from closing completely, and check the seals around the door to make sure that they are not damaged.